If you've just bought a new iPhone and Want to Have Apps That Explores ,Most Amazing Features of Your Smart Phone, Then Damm! You are at right place man go on Reading..
Smart Phones are growing by leaps and bounds , about 65% new phone bought by User at this Time , are smart phones in India, and percentage is quite High in US nearly 85-90% . Smart Phones Offer So many Feature like emergency, GPS look up and lots of medical app etc that Separates them with ordinary phones and provide a way to have strong leg in the market. You can estimate the importance of smart phone in daily life by this fact. Here is Top 5 Apps of iPhone. 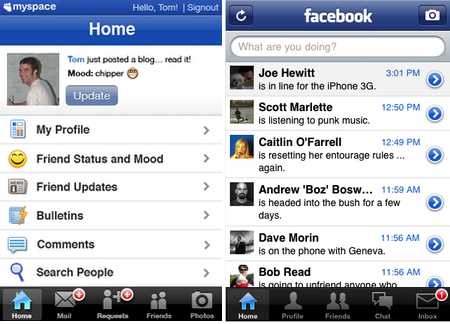 Facebook for iPhone lets you stay connected and share with friends on the go. Start a chat, keep up with friends' photos and status updates, look up a phone number, upload photos to Facebook and more—right from your iPhone.Amazing App,as Free i like it most haha :P.
The Kindle app is optimized for the iPad, iPhone, and iPod touch, giving users the ability to read Kindle books, newspapers, magazines, textbooks and PDFs on a beautiful, easy-to-use interface. TuneIn is a new way to listen to the world through live local and global radio from wherever you are. Whether you want music, sports, news or current events, TuneIn offers over 50,000 stations and 120,000 shows for you to choose from. The TuneIn Radio Pro app for iPhone, iPad and iPod touch puts this entire experience in the palm of your hand with the added benefit of recording what you’re listening to. Here is Top 5 iphone Games. Here we Go so you have top 5 games and app for iPhone now , enjoy with the games and waste a little bit time and Please Share your Valuable views with comment ,Meet you next time .